The A3 has been a bit of an in-joke in the Chapter. Indeed, it has become something of a challenge to plan a ride-out avoiding Putney, Tolworth and Hook. However, if your brief is to commemorate Lord Nelson’s victory at Trafalgar, two centuries ago this month, and you are based in South-West London, Nelson’s Column and Trafalgar Square is simply not going to cut it! The obvious choice has to be HMS Victory, Portsmouth and, you guessed it, the good old A3. The only problem with that is everyone else has the same idea and Portsmouth is notoriously gridlocked on Sundays, especially around the historic dockyards. Step forward ‘Lord’ Langley Gifford, who knows the area well, to suggest Fort Nelson, standing on Portsdown Hill, high over Portsmouth. Clearly, it had to be done. The problem with Autumn rides is planning the weather. Assuming the worst, we decided to keep it simple, and plotted a course straight down the A3 to Hindhead, and the Devil’s Punchbowl Café for a breakfast stop. Once fed and watered, we opted for the classic A272 route west from Petersfield and then to zig-zag our way towards the Palmerston fort using the quiet back roads. We reckoned we had all the bases covered. A stop to refuel bikes and riders and to rendezvous with local members, a bit of twisty road to sharpen the senses, a destination with parking, a view, interest, food and facilities. In fact, everything apart from glorious sunshine. Just like they say that a good meal starts with a little hunger, it is certain that the best rides are accomplished wearing sunglasses! It was extremely tempting to turn off the A3 and head for some ‘B’ roads, but the unseasonably good weather seemed to have caught the day-trippers unawares and we had all three lanes to ourselves. I believe we established a Chapter record and rode 80+ miles with only 5 drop-offs, before arriving at Fort Nelson. 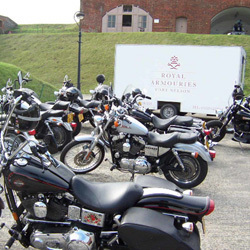 The staff were waiting to open the main gates and invite us to park up inside the fort amongst the large guns that are part of the Royal Armouries collection housed in the Fort. Again, a top job by ‘Lord’ Langley, who organised this VIP treatment. All-in-all, our objectives of keeping things simple, yet flexible seemed to have worked out pretty well and everyone was sporting a ‘Harley smile’ as we wandered off in all directions to make the most of a fine day. Thanks are due to Langley Gifford for doing all the work, the staff at Fort Nelson for making us feel special, Rob Warr for opening up 611 early on Sunday and bringing breakfast with him, the poor staff at the Devil’s Punchbowl trying to feed all of us and all the sports bike riders who stayed in bed!